The Loft command fits a surface through selected profile curves that define the surface shape. Select the curves in the order in which the surface should pass through them. Select open curves near the same ends. For closed curves, adjust the curve seams. Select a seam point marker, and move it along the closed curve. Continue to adjust the seam points until they line with each other and the closed curves all have the same direction, and then press Enter. Allows picking a location for the start or end of the loft at a point. This tapers the loft to the selected point. No point object is necessary, but it is a good idea to have some reference geometry in place to aid in picking the point location. At the start or the end of the loft, click the Point option. Pick a location for the start or end location. Determines the knot and control point structure of the surface. When some, but not all, endpoints of loft shapes touch, the loft type is restricted to Straight sections to avoid self-intersecting loops in the resulting surfaces. Creates a closed surface, continuing the surface past the last curve and around to the first curve. Available when you have selected three shape curves. If the start curve is a surface edge, the lofted surface maintains tangency with the adjacent surface. You must use at least three curves to activate this option. If the end curve is a surface edge, maintains tangency with the adjacent surface. You must use at least three curves to activate this option. If checked, the loft creates a single surface. If unchecked, the loft creates a polysurface when the input curves are joined tangent curves. Faces in the resulting polysurface correspond to the tangent sub-curves in the input curves. Click the end of a shape curve to reverse the direction. Curves will not be rebuilt. Rebuilds the shape curves before lofting. Refits the shape curves to the specified tolerance value. The DevLoft command creates a single developable surface between two curves. 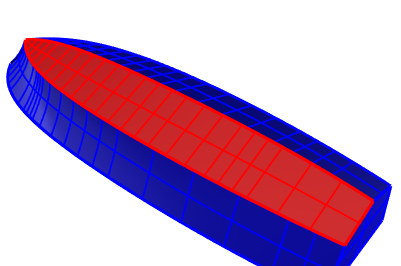 The resulting surface can be flattened by the UnrollSrf command. Select two curves near the same ends. Type a hyphen in front of the command name: -DevLoft. Interactive mode provides options for fine tuning the resulting surface. Lines across the surface that define the straight sections on the developable surface. A developable surface can be flattened to a plane by bending along the ruling lines with minimum stretch or compression distortion. After the initial surface is created, at the prompt, pick a point on one of the curves. At the prompt, pick a point on the other curve. The preview surface updates to reflect the new ruling. The number of rulings across the surface. It may help to run Untwist more than once. Use the CurvatureAnalysis command to visualize the Gaussian curvature of the surface. 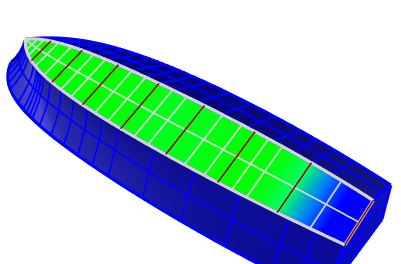 The analysis quality is based on Polygon Mesh Options in the CurvatureAnalysis command. The Gaussian curvature analysis in the interactive mode. The blue area is where stretch or compression distortion happens when the surface is flattened. Acceptable results depend on material properties and manufacturing processes. A surface resulting from the DevLoft command is not guaranteed to be manufacturable. Flatten (develop) a surface or polysurface with curvature in one direction to a planar surface.